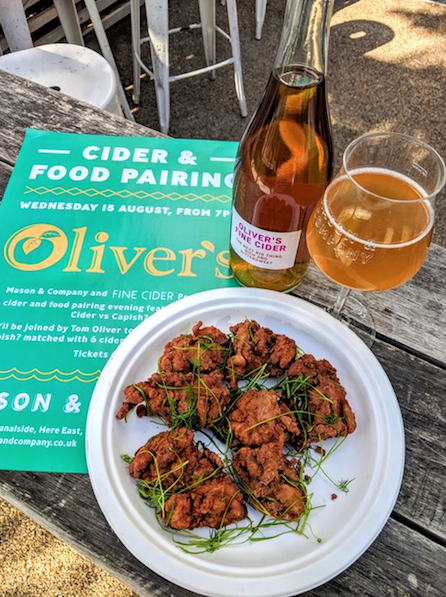 The resurgence of interest in cider continues with a six course cider-pairing dinner, being held at the Mason & Company bar in Hackney Wick on Wednesday 15th August. Organised as a collaboration between Capish?, which is now based at Mason & Co, and The Fine Cider Company and Oliver’s Cider & Perry, it is a series of six 'small plate' courses, with six cider or perry pairings. Tickets are just £35 + fees - should be an amazing night! "We’re delighted to announce that our Capish? Kitchen has paired up with The Fine Cider Company and Oliver’s Cider & Perry to bring you a very special cider and food pairing experience on Wednesday, August 15th from 7pm. Oliver’s is a ciderhouse based on a farm in Ocle Pychard, Herefordshire, that produces small batch ciders and perries. All ciders are fermented by wild yeasts and made from hand-picked and unsprayed fruit. The result is something that will delight cider drinkers, wine drinkers and beer drinkers alike! Our Capish? kitchen is working closely with Tom Oliver to deliver a tantalising menu of 6 small plates expertly paired with 6 ciders. Tom Oliver himself will be joining us on the night, guiding us through the world of cider and each pairing. Join us for a perfect summer evening with delicious food and cider against the peaceful backdrop of the canal. Places are limited and tickets are available now for £35, which includes 6 pairings.